GG. It's the universal sign-off for those players who know they've been beaten in the toughest mental arena of modern gaming: eSports. "Great Games" follows 3 of the most well known Esports today - StarCraft, Dota 2 and League of Legends - bringing the history and the people of the newest sporting frontier into the spotlight. Travel back in time to the beginning of Esports in South Korea and to one of the most intense rivalries in the history of StarCraft Brood War: Jaedong and Flash. A culture of intense study and rigorous training gives birth to a fierce environment of competition and innovation. After a defacto winner has been crowned, we turn to StarCraft 2 and the glimmers of greatness in a new player named HerO. We transition into the world of MOBAs. The creation and sudden explosion in popularity of Dota ushers in a new field of players from around the world. The culture of Chinese Dota stacks up against the rag-tag westerners of Team Liquid at The International 3 as we see just how similar these seemingly disparate gaming compatriots are and how their stories of stress and camaraderie transcend all borders. To win and to succeed may not always be the same thing. The sister game of Dota 2, League of Legends, takes center stage as the most widely played MOBA in the world. From the first gaming house in South America to the first ace team in the USA, see how those with little but courage and determination affect real change in their lives and in the lives of those they care about. In the end, it is from people like Travis and Doublelift that the real meaning of eSportsmanship is revealed and the righteous nature of true gamers is affirmed. GG. Do you want a chance to win some collectible memorabilia signed by the Director and some of the players that feature in Great Games? Look no further. 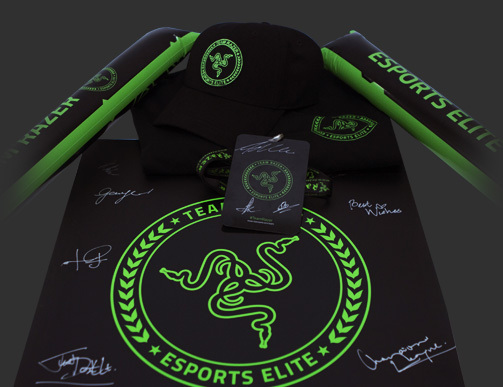 All you need to do is enter your email, name and country below and we'll pick one lucky winner to win it all: the all-new Team Razer cap and t-shirt, a signed Team Razer VIP collectible pass, lanyard, poster, and a pair of inflatable Team Razer bangers!